Situated in a field behind a modern bungalow this impressive stone stands at a height of around two metres and around 1 1/2 metres wide. 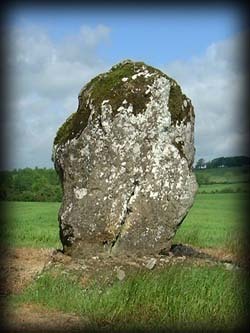 Approximately two kilometres west of Killucan Wayside Crosses this stone is one of a few megalithic monuments worth visiting around this part of Westmeath. Situated: In a field behind a bungalow about 1 kilometre west of Killucan wayside crosses. Discovery Map 42: N 5551 5070. Last visit June 2002.